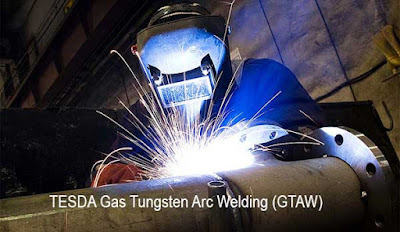 Another kind of Welding course is offered by TESDA: Gas Tungsten Arc Welding (GTAW) NC II which trains you in welding carbon steel plates and carbon steel pipes components as précised by design, blueprints, diagrams, work order, welding process or practical directions using GTAW equipment. It is almost the same as Shielded Metal Arc Welding but different in equipment and procedures. GTAW deals with the welding of thin sections of stainless steel and non-ferrous metals such as aluminum, magnesium, and copper alloys while Shielded Metal Arc Welding covers the manual process of welding consumable electrodes, iron and steels. Gas Tungsten Arc Welding (GTAW) NC II course can be finished in a minimum span of 268 hours of sessions. These are the fixed common requirements that you need to prepare. Nevertheless, some institutions require more depending on where you would enroll at so it is better to inquire first and get in touch with the personnel or school or training center’s official representatives for you to be fully aware on what to bring aside from those mentioned above. Another note to first time takers: Some TESDA-Accredited institutions may oblige you to undergo and finish Gas Tungsten Arc Welding (GTAW) NC I first before being permitted to take Gas Tungsten Arc Welding (GTAW) NC II. Eligible graduates of Gas Tungsten Arc Welding NC II may find employments as GTAW/TIG Welder both local and international. There are numerous jobs abroad that need skilled workers especially in New Zealand and middle east. Individuals who enrolled in this short course may have to undergo Competency Assessment first before graduation. This is to ensure the issuance of National Certificates (NC II) that will be given to students once they pass the assessment. You may find more information regarding the assessments and certifications on this page.